The EBMHS series of miniature PIR (passive infrared) presence detectors provide automatic control of lighting loads with optional manual control. Three models are available: premium, direct dim, and analogue dim all of which will switch incandescent, fluorescent and compact fluorescent lighting. The direct dim variant controls DALI or DSI digital dimming ballasts whilst the analogue dim variant controls 1-10V dimming ballasts. 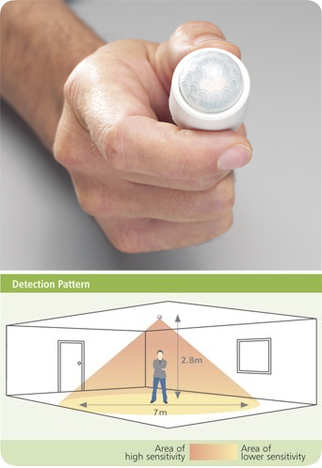 The unit detects movement using a PIR sensor and turns the load on. When an area is no longer occupied the load will switch off after an adjustable time out period. Two power supplies are available. Standard power supply: This power supply has a 6A relay. It also has connections for an external switch that can be used to turn on the load when absence detection mode has been set or raised / lowered with dimming variants. Slim-line power supply: Where space is at a premium the slim-line power supply is compact and suitable for luminaire mounting where a 2A relay is sufficient. This power supply does not have connections for external switches. A selection of fixing clips to allow the unit to me mounted in or to the side of a luminaire are available.